A currach is a type of Irish boat with a wooden/wicker-work frame, over which animal skins or hides were stitched together. They were propelled by oars or sails according to circumstances. 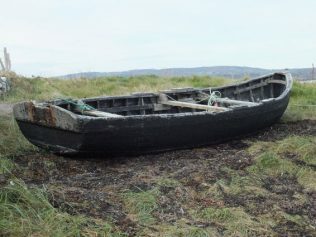 The currach has traditionally been both a sea boat and a vessel for inland waters. The construction and design of the currach is unique to the west coasts of Ireland and Scotland, with variations in size and shape by region. It is referred to as a naomhóg in counties Cork, Waterford and Kerry and as a “canoe” in West Clare. It is related to the Welsh coracle. 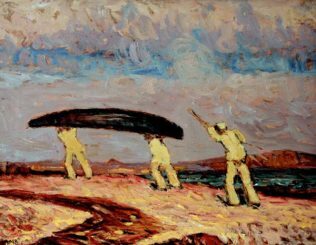 The plank-built rowing boat found on the west coast of Connacht is also called a currach or curach adhmaid, and is built in a style very similar to its canvas-covered relative. A larger version of this is known simply as a bád iomartha. These boats are constantly mentioned in literature. They are used still round the coasts, but tarred canvas is employed instead of skins. 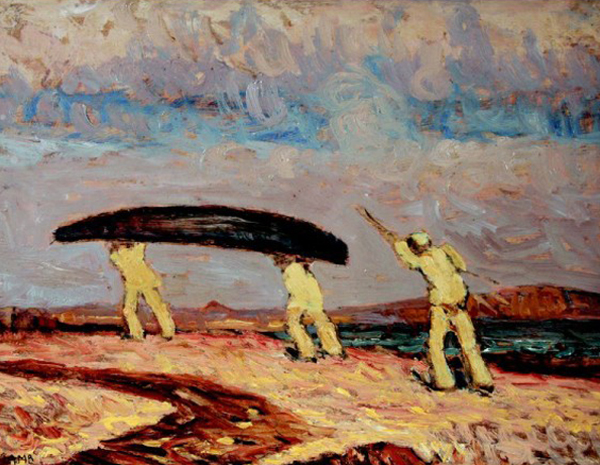 The currach was the best-known of all the Irish boats. It was made of a wicker-work frame, covered with hides (animal skins) which were stitched together with thongs. Some currachs had a double hide-covering, some a triple. They are still used round the coasts, but tarred canvas is used instead of skins. They were propelled by oars or sails according to circumstances. 1. Many currachs were so small and light that thy could be easily carried on a man’s back from creek to creek overland, as people sometimes do to this day in Ireland. 2. Currachs, when intended for long voyages, were made large and strong, furnished with masts and solid decks and seats, and having the hides tanned. The first settlers, after coming across Europe, settled in the northern part of Ireland possibly arriving in boats much like the currach, about 30ft in length. The development of basic joining techniques in the Neolithic period would have allowed the construction of simple timber frames at that time. Its early humble origins in the hide-covered basket are still evident in the Boyne River hazel currach in the east of Ireland. As the only seaworthy craft of the time, the skin boat played a crucial role in bringing the first Neolithic farmers to the British Isles. The history of the currach is fascinating and it has played a significant role in the development of human civilization, from the spread of farming to carrying early Christian saints all over Europe. The skin boat was already a popular vessel when early Christian monks entrusted their life to God’s hands – and to the fate of their small wicker and skin boats – in order to spread their spiritual message all over Europe. By far the greatest part of the water-communication round the coasts and across the narrow seas, as well as in the lakes and rivers, of Great Britain and Ireland, was carried on in those early days by currachs, which indeed were used also in other parts of Europe. We know that in the fourth, fifth, and sixth centuries the Irish sent numerous plundering expeditions, made in currachs, to Britain, as mentioned in several pieces of literature. Gildas, a sixth-century British monk, pictures hordes of them as landing from such vessels which he mentions at p. 83 et seq. 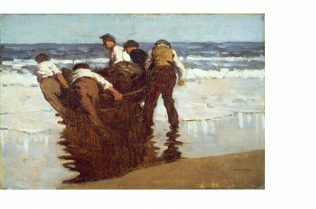 The consistency in accounts from the early Middle Ages to the early modern period makes it likely that the construction and design of the currach underwent no fundamental change in the interval. In medieval annals, skin boats had a reputation for a less spiritual purpose. Cattle raids by the early Irish against Britain were successful thanks to the extraordinary qualities of skin boats. Light, seaworthy and extremely manoeuverable they also had an astonishing load capacity. 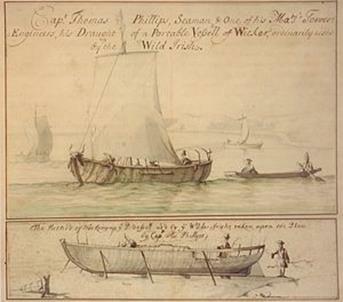 The construction and sailing of a seagoing currach of the 17th century was depicted in some detail by an Englishman, Captain Thomas Phillips: “A portable vessel of wicker ordinarily used by the Wild Irish”. 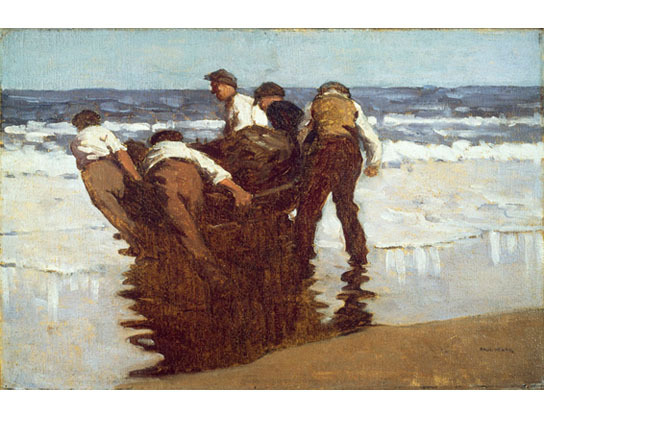 Phillips sketches are detailed and represent a valid development of the ocean-going currach. Julius Caesar described encountering currachs in which the Scoto-Irish made incursions into Britain. He describes them as having ‘keels and masts of the lightest wood’. Solinus, Latin grammarian and compiler of the third century, writes about the common course of the currach between Ireland and Britain. 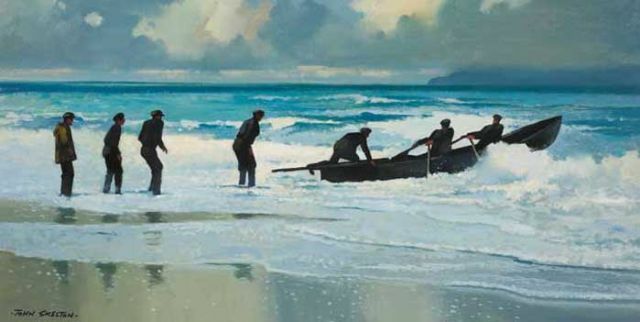 Adomnán, in his life of St. Columba, describes the voyages of St. Cormac in a currach one of which he sailed into the North Sea and remained there for fourteen days in perfect safety. Another of his journeys included sailing from Erris, Co.Mayo. Account of the voyage of St Brendan: Navigatio sancti Brendani abbatis. This contains an account of the building of an ocean-going boat built in preparation for St Brendan and his companions’ voyage on the Atlantic. Though the voyage itself is essentially a wonder-tale, it is implied that the vessel as described was built in accordance with ordinary practice at the time. “using iron tools [saws, hammers, chisels, etc. ], prepared a very light vessel, with wickerwork sides and ribs, after the manner of that country, and covered it with cowhide, tanned in oak-bark, tarring its joints: and they put on board provisions for forty days, with butter enough to dress hides for covering the boat, and all utensils necessary for the use of the crew”. A mast was then erected in the middle of the vessel and a sail supplied. Their stories, and those of their pre-Christian predecessors, fuelled the spirit of the imrama, medieval Irish Christian literature in which a protagonist sets about voyaging in penance for sins committed. In medieval annals, skin boats had a reputation for a less spiritual purpose. Breccán, grandson of Niall of the Nine Hostages, had a fleet of fifty currachs trading between Ireland and Scotland, till they were all swallowed up in the terrible whirlpool near Rathlin Island, which thenceforward took the name of Coire-Bhreccain, Breccan’s caldron or whirlpool. A 17th-century account in Latin by Philip O’Sullivan Beare of the Elizabethan wars in Ireland includes a description of two currachs built in haste to cross the River Shannon. This vessel is described as being able to carry 30 armed men at a time. The earliest consistent, documented information for the numbers of fishing boats in Ireland comes from the 1837 First Report of the Commission of Inquiry into the State of the Fisheries, which indicates that thousands were in use along the west coast. British Coracles and Irish Currachs (Hornell, 1938) gives us an overall view of the currach situation prior to World War ll. Hornell provides historic information and good descriptions and drawings of the various types. It was the most comprehensive study on currachs ever published, and is still widely quoted today. The vessel is some twenty feet long: it has a keel (the lengthwise timber structure along the base of a ship) and a rudder, (a flat piece hinged vertically near the stern of a boat or ship for steering) with a stiff wickerwork hull (the main body of a ship), and a mast. Because of the keel, the craft is shown as being constructed from the bottom up. A covering of animal hides was added when the wickerwork was complete, the sides being supported by rods in the interval. Two elements are essential for construction: a lightweight skeleton and a dense and flexible sheet material to cover it – functioning like a skin over a rib cage. Currachs are flexible – moving with and giving way to these forces, reacting with rather than in opposition to them. The gunwale, the latticework of ribs and laths and the canvas seem fragile in themselves, but together form a strong, ductile and tensile structure that is able to withstand great forces of wind and wave. The currach on Inishturk have been used for the last 100 years and are of a wooden lattice and plank construction with a calico and tarred outer lining for water proofing. A sturdy, light and versatile vessel, the Inishturk currach was traditionally rowed by three men and used for fishing and as the main transport between the island and the mainland. 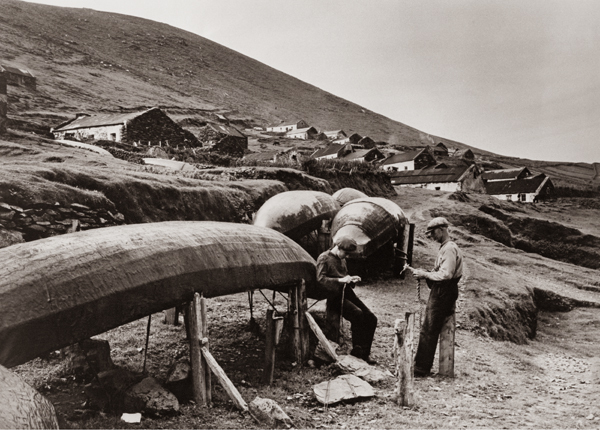 On Achill Island the currach is built with double gunwales. In South Mayo they differ from other currach types because the bottom and sides were covered with thin planking. The Connemara currach is also distinguished by a double gunwale and by a particular form of pivoting block or “bull” attached to one side of the squared region of the loom of the oar. 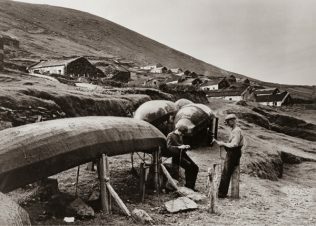 The Aran islanders, like the Blasket islanders further south, were assiduous users of the currach. Unusually for the area a sail was used. The Clare currach closely resembled that of the Aran Islands. In construction, a series of wooden markers were sunk into the ground at definite distances apart. These helped show the width desired for the lower gunwale frame. Currachs covered in cowhide were still common in the 1840s above Lough Ree, in the centre of Ireland. Thereafter they disappeared except at the seaward end of the Shannon Estuary. Kerry currachs had a reputation for elegance and speed. All were fitted for sailing with a short mast. Currachs still have plenty to offer in our time and have great potential to contribute to a sustainable way of life. Materials from local, regenerative resources add to a low embodied energy value and environmental footprint of the boats. Currachs are easily driven by sail or oar and are inexpensive to make and maintain – characteristics that add to their appeal as environmentally sound leisure boats. With the advent of new technology and economic prosperity in Ireland, many researchers prophesized the disappearance of the currach over the last thirty years. Indeed, commercial fishing currachs along the west coast of Ireland seem to have almost completely declined. Today attention is drawn to their value as leisure craft as they are refreshingly different from the slick and expensive cruisers that dominate – and often pollute – our coastline. Founded in 1993, Meitheal Mara is a community boatyard in the heart of Cork City, a registered charity and nationally-accredited training centre for currach building. The high point of Meitheal Mara’s calendar, Ocean to City – Án Ras Mór is Ireland’s largest and most inclusive rowing race, and the anchor for the week-long Cork Harbour Festival each June. The West Clare Currach Club is group of enthusiasts who have come together to promote currach rowing for recreation and competitive sport. Currach rowing combines fitness, seamanship, team sports, leisure rowing and the appreciation of the outdoors. In 2004 it built 6 local fishing currachs of the West Clare design over a two year period involving up to 35 men and women on the Loophead peninsula. Friends of West Clare Currach Club in Yonkers, New York have held fundraisers to help them travel to other regattas and races such as the Great River Race in London, Events in Brittany and the Ocean to City Race in Cork. Caledonia, or an Account, Historical and Topographical, of North Britain from the Most Ancient to the Present Times, George Chalmers. What were the typical materials used in making a currach? While making a Boyne River Currach we would make the framework of hazel rods, its gunwale of woven sally twigs and have a single ox hide covering the frame to help form the shape of the boat. Why do you think the currach has declined in Ireland in the last few decades? Netting salmon in fresh water became illegal in Ireland around 1948; this definitely started a huge decline in river currachs. Can you describe how you would steer a currach? I would use a pair of bladeless oars pivoting on a single thole pin, which is a design used in Aran and Clare. A large currach with several men would have longer oars; each man keeps one hand slightly ahead of the other because of overlapping grips. I would have kneeled on my coast while steering the boat with my oars, some men used a pad of heather to kneel on. Can you describe in detail the design your locality used for their currachs? On the west coast of Mayo and the north coast of Galway we had our own distinctive features. The prow and stern are not nearly as steep as the Aran currach. It is much shallower and its profile less extreme. We set our planks close together, replacing the laths used elsewhere. We canvas covered our currachs as this provided more protection from the rocks. Further north in Mayo, their oars were pivoted between two thole pins. How are newly designed currachs made? Nowadays the framework is made of oak laths, the gunwale is also made of wood and a covering of tarred canvas is used. Why are there so many different versions/styles of currachs? Well different currachs are used for different purposes. The small currach is the ideal craft for hauling lobster pots which have to be set as close as possible to the rocks. The sea currach is found only in Donegal and is remarkably similar to the Boyne River Currach. The Boyne River Currach has a shallow draft and its manoeuvrability enabled it to get right in under the wear and avoid the undertow. From Achill to Kerry, currachs have a double gunwale. The Kerry currach locally called Naomhog is considered to be the most elegant within the currach community. It uses a gently curving bow and stern which makes it easy to use. Are sails used on currachs? the builder is ” padraigh o’duinning” from Meithal Mara (Mare Nostrum). but before the XIX century the building techniques are différents. I know “BOVINDA” from the BOYNE HERTAGE GROUP. from, before, the coast guard organisation. Niamh, Great overview, well structured and written. Very informative with resources to follow up further. Thank you very much. Niamh, Great job. Kerry 4 seater Currachs are being raced in the states under the North American Currach Association in 7 cities. Albany,NY bringing 8 rowers to Barcelona to race in their St. Patrick’s Currach Regatta 19 March. Albany Irish Rowing Club President.